LAKE MARY, Fla. (AP) — George Zimmerman showed up at the house where he had lived with his estranged wife during his trial on murder charges and began taking photos of her as she removed belongings moments before a domestic dispute broke out, according to a police report released Wednesday. Shellie Zimmerman was with her father and a friend at the house owned by her parents when George Zimmerman showed up with a camera on Monday. George Zimmerman recorded the items she removed from the house and also the belongings she had placed in her father's truck, the report said. Shellie Zimmerman filed divorce papers last week. Zimmerman said his wife was "taking property that was not agreed upon and he began taking pictures and recording the items," the report said. Shellie Zimmerman then took her iPad and started recording her husband taking photos of her, authorities said. George Zimmerman went in the house and locked the front door. What happened next is in dispute. Shellie Zimmerman told investigators she heard her father screaming from the garage. Her father, David Dean, told her that Zimmerman had hit him in the face, the report said. She said her husband then smashed her iPad. During a 911 call, she also told police that George Zimmerman was threatening her and her father with a gun. Later, however, she said she had not seen any gun. Police said they found no gun, but that Shellie Zimmerman's father "did have a swollen red mark on the bridge of his nose." 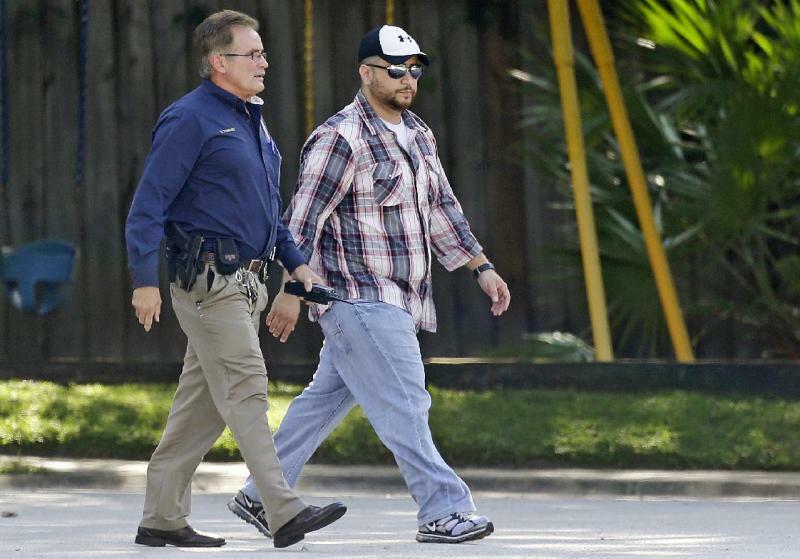 George Zimmerman told investigators that his wife had told him she was done picking up her belongings. He said he locked the front door and went to the garage to close it when Shellie Zimmerman's father confronted him, according to the report. Shellie Zimmerman's father threw down his glasses and charged his son-in-law, according to George Zimmerman's account. Shellie Zimmerman at some point hit her husband with her iPad, George Zimmerman told investigators. Police officers asked George Zimmerman to remove his shirt so they could see if there were marks on his back. "There were no signs of trauma, redness or marks of any kind in the area where he said he was struck," the report said. As many as seven people were at the house — friends of the Zimmermans — and they all have been questioned by investigators, Lake Mary police spokesman Zach Hudson said. The friends said they didn't see what happened and footage from the house's surveillance cameras was inconclusive, Hudson added. Both sides are refusing to press charges, but Florida law allows police officers to arrest someone for domestic violence without the consent of the victim. Investigators are hoping video from the iPad will allow them to determine if charges should be filed. Hudson told a news conference Wednesday that law enforcement analysts are having difficulty extracting the video because the iPad is in "bad shape." He said because investigators don't currently have the necessary tools to extract the video, it could be several weeks or months before the video can be analyzed — and even then they aren't making any promises. The iPad's chip also suffered some damage, Hudson said. Without an examination of the video, he said he doesn't expect there to be imminent charges against either person. Lake Mary is about seven miles southwest of Sanford, where George Zimmerman, 29, fatally shot unarmed black teenager Trayvon Martin during a fight last year. Zimmerman, who identifies himself as Hispanic, was acquitted in July of all charges in the shooting. On Tuesday, police released a dash cam video showing George Zimmerman being handcuffed after the dispute. In the video, officers ordered Zimmerman to put his hands up and drop to his knees. One officer approaches with his gun drawn while another handcuffs Zimmerman. Mark O'Mara, who represented George Zimmerman in his murder trial, said on Monday that his client did nothing wrong and the dispute was typical for a couple going through a divorce. On Tuesday, O'Mara said he was not going to represent George Zimmerman in this matter. "I've come to know them as a family, and it's not a good idea to get in between them," O'Mara said. Shellie Zimmerman, 26, filed for divorce last week. She and her husband separated a month after he was acquitted July 13 in the fatal shooting of 17-year-old Martin in a gated community in Sanford. Zimmerman said he acted in self-defense when he shot Martin in February 2012. He wasn't charged until 44 days after the shooting, leading to protests nationwide from people who believed he should have been immediately arrested. Follow Kyle Hightower on Twitter: http://twitter.com/khightower.